The best jet engine book, written in plain English! If you want to know about jet engines, this is the book for you. If you want to understand how jet engines work, this is the book for you. 'A Simple Guide To Understanding Jet Engines' is a book that helps any reader achieve an easy understanding of how jet engines work. Unlike other Jet Engine books, which are too detailed and complicated, this book is written in a plain, simple English so it is easy for anyone to understand. A well thought out piece of work that provides a concise yet humorous account of how the gas turbine engine functions. Combining fact with a quirky sense of humour it is lavishly littered with David’s cartoons that serve to reinforce facts in a more understandable way. 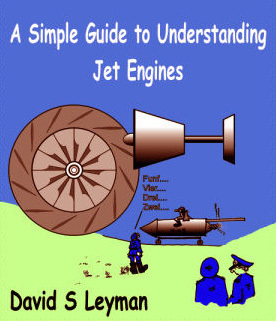 A must-have book for anyone who ever wondered how the ‘Jet’ engine works. ...Peter Farrow, Chief Executive, Air Service Training Ltd, United Kingdom. A sure fun way of understanding Gas Turbines. ...Sunmuga Pati Kanaratnam, Head Operational Performance (Maintenance), Air Deccan,India.